Well I know it’s disgraceful but I think it is at least a year since my last Newsletter!!! And I have a laptop now, so no excuse! Mind you it is taking me a while to get used to it. I am sure you all know by now I may be very crafty but I am definitely not very techy. Have recently been to the Stitches Trade show at the NEC in Birmingham and had, as always, a fantastic time. I cadged a lift with the lovely Janet who very kindly drove us there and Dorothy from Sheringham Handicrafts. Some of the goodies I ordered at the show have now arrived at Owl Tree Crafts. We have the new range of Opal Sock Yarn Fresh and Juicy together with a new batch of Eculan for handwashing those precious handknitted jumpers of yours. 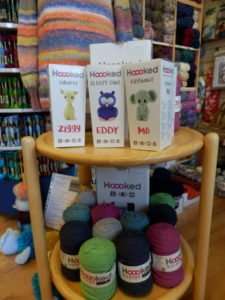 Also arrived a few days ago are the Hoooked Yarns and crochet kits, can’t wait to get started on the Owl (although I think Mum has her eye on Eddy Owl too!). Materially speaking the new Craft Cotton Fat Quarter Bundles are fantastic, including designs featuring Peter Rabbit, new nauticals, textured fabrics, fabrics with an Indian flavour, Scotties dogs, the list goes on! I have also ordered some nautical fabrics from the Jane Makower Company which have now arrived but are at home awaiting the chop! Christmas fabrics from Moda are also ordered but won’t be here until May/June time. Speaking of Moda, I now have a catalogue showing all their long term fabrics like the Bella Solids, Grunge, French General, dots, marbles etc. so if you want a peek come in and ask. Solocraft have brought out some new Zen Embroideries and these have already arrived together with some of their new thread packs. Very exciting news! I am going to be stocking the Crafter’s Companions’ Debbie Shore range together with their Gemini Cutter system. 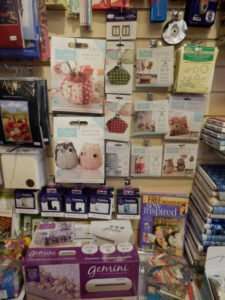 This will include her dressmaking patterns, templates, quarterly magazine, patchwork die cuts, materials, little sewing kits for purses, bags, pincushions and owls of course! Also zips on a roll. This has now arrived! One of my little indulgences (and there always seems to be at least one each year at the show) is the Toft Alpaca animal crochet kits. I know they are expensive but they are sooooo cute!!!!!!!!! I also have the Toft books, Edward’s Menagerie and Bird Menagerie. I know it’s very cold today but soon we will be thinking about our summer knits. I didn’t think there was too much new on offer this year but there are some lovely new colours for the ranges that I already stock. Wendy have brought out a gorgeous baby version of their Pixile yarn which is named “Pixie”. It is ‘flying’ off the shelf already. It is very very soft with some lovely colours in the range. 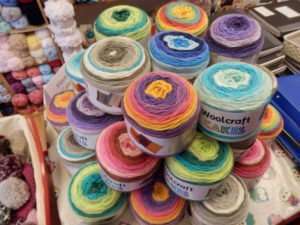 As mentioned on my Facebook Page the Yarn Cakes have now landed at Owl Tree Crafts and I am having great trouble stopping myself from starting something in every colour!! The yarn is an Aran weight and very soft. 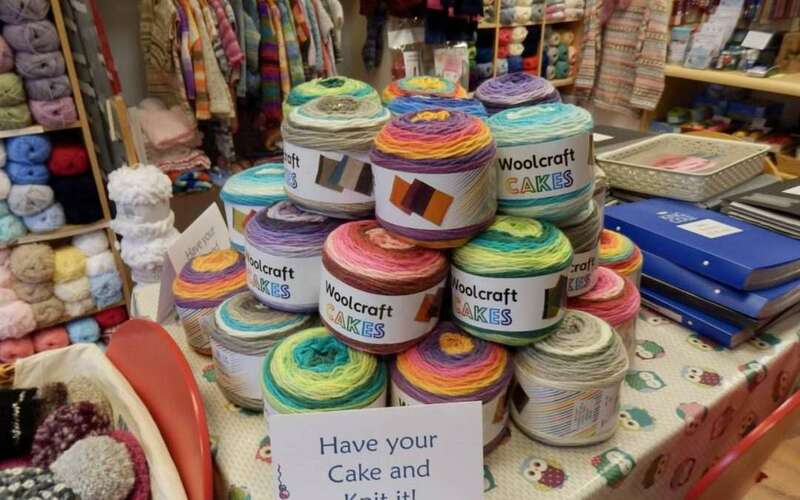 20% wool and 80% Acrylic, 200gm per cake. Not at all fattening so have your cake and knit it! YARN SHOP DAY will be with us soon, 6th May, hopefully it will be a bit warmer by then. I have decided this year that our knit for Operation Christmas Child will not take place on Yarn Shop Day but later in June on Knit in Public Day so that hopefully we will be warmer when we knit on the forecourt! However there will be tea and cake and if it should be warm we can sit out and knit!! There will be free patterns as usual, a free pen/tablet pen with all purchases over £10 . Free prize draw entry with every spend of £5 or over for one of our five Yarny Goody Bags.